Based on Kazuo Ishiguro’s acclaimed novel, the film stars Carey Mulligan, Keira Knightley and Andrew Garfield in this story of human love and tragedy. It follows them as they advance from being childhood friends, to odd rivals, to individuals sharing a common sorrow. Beautifully subdued and restrained, it makes minimal use of dialogue, instead relying mostly on atmosphere to evoke or express emotion. I read the book first because I didn’t want to spoil it with the movie. But as I watched the film yesterday, the reverse happened. I wanted so badly to forget the novel, to pretend I didn’t know what would happen next, to let the film absorb me so entirely everything else would fade in comparison. But of course it did not. That’s too much to ask. So I noticed changes, deviations from the book. I paid attention to the selections and liberties the film took, as well as those it skipped over: Norfolk, the maps, Miss Geraldine. I knew choices had to be made, and I do not begrudge the movie, but I cannot help feeling that I did not enjoy it as much as I would have liked. I can only blame myself, of course, for having read the novel already, but I wish I didn’t have to choose. I wish I could have had both. Unlike most book-based movies that only constitute offense, Never Let Me Go actually complements and deepens the reading experience. It adds new dimensions to the story that a book would have never made possible. The score, for example, I found appropriate and lovely and affecting all at the same time. In one scene it made the hairs on my arms stand on end, accompanying pure heartbreak. I cried at that point (just a little bit though, not as much as Maki). Both Angel and Ace have warned me about this before, but I still couldn’t help myself. Angel described it well: none of us could watch the last few minutes properly because of the tears blurring our vision. I must have replayed this one scene (my favorite, and I hazard to say everybody else’s) at least four times already, yet until now it does not fail to move me. I cannot imagine it ever will. It had never occurred to me that our lives, so closely interwoven, could unravel with such speed. If I’d known, maybe I’d have kept tighter hold of them. What I’m not sure about, is if our lives have been so different from the lives of the people we save. We all complete. Maybe none of us really understand what we’ve lived through, or feel we’ve had enough time. 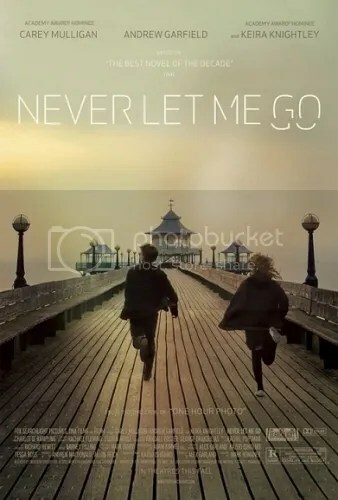 This entry was posted in Drama, Film, Science fiction and tagged Andrew Garfield, Carey Mulligan, Keira Knightley, Mark Romanek, Never Let Me Go on January 30, 2011 by Michelle. Killing a novel is easy (authors are a bit trickier, but that’s a theory for another day). Off the top of my head: The Reader, Atonement, The Hours—although this last one I found difficult not to enjoy. You must know what I’m talking about. Films, books: most of the time it’s either one or the other. Exceptions exist, but in general you always end up destroying one, and if I have to choose I’d of course save the book. Reading trumps watching any day (except when they do the reverse and make novels out of movies, in which case the latter wins). What I’m trying to say is: I made a vow to stop my book-killing spree, and so planned to finish reading Never Let Me Go first before watching it. The book spans the lives of Kathy, Ruth, and Tommy. Narrated in flashbacks, it begins with Kathy reminiscing about their shared childhood in mysterious Hailsham. Prodded by their meeting together for the first time after many years, she looks back on the rest of their history and tries to make sense of her present in light of the haunting past. I thoroughly enjoyed this novel, but even as I was reading it another level of my consciousness dissected the craft that went into its creation. Discovery: something poignant permeates Ishiguro’s writing, so subtly that it takes you by surprise. I did not expect to, but I identified so deeply with the characters—tender, innocent, frail as they are—that towards the end I found myself seized by a tremendous hope for their happiness. But there exists so much room for disconnection: in the unsaid, in understandings that turn into misunderstandings, in the expansion of trivialities in place of actual conversation. In Oliver Ortega’s poem “Ilang Sandali Lamang”: “Sabi nila, ang / isa sa pinakamalaking / problema / ang kung paano / sasabihin ang problema. / Kaya nagsimula / tayong maghiwa / ng mansanas / kaysa mag-usap.” We never talk about the most important things. This is tragedy. A few days ago I promised Angel I’d finish this book soon so I can return it to her and “move on.” Ace teased me about not being able to “let it go,” and though I laughed it off then, I think now that it is true: some part of me will never be able to surrender this. Because somewhere underneath, a part of us stayed like that: fearful of the world around us, and—no matter how much we despised ourselves for it—unable quite to let each other go. My heart had done a little leap, because in a single stroke, with that little laugh of agreement, it felt as though Tommy and I had come close together again after all the years. And so we stood like that, at the top of that field, for what seemed like ages, not saying anything, just holding each other, while the wind kept blowing and blowing at us, tugging our clothes, and for a moment, it seemed like we were holding onto each other because that was the only way to stop us being swept away into the night. 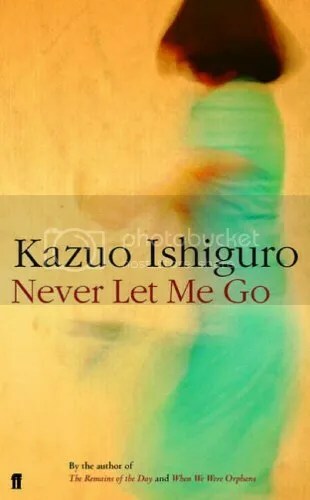 This entry was posted in Book, Novel and tagged Kazuo Ishiguro, Never Let Me Go on January 22, 2011 by Michelle.